Well, we've had our first taste of winter here in SUNDRE and, I for one, don't care for it!! A common question at this time of year from potential REAL ESTATE clients is, "Is this a good time to sell or is this a good time to buy?" and of course the question they ask is depending on whether they're buying or selling a piece of REAL ESTATE. Any REALTOR will tell you that that all depends on several factors, your choice of REALTOR being one of the most significant, and these are factors that are often dependant on things that are totally out of the REALTOR'S control or sphere of influence. Autumn, in my experience, is usully a good time to either market your REAL ESTATE or purchase that HOME or other type of REAL ESTATE, be it bare LAND or maybe even that COMMERCIAL piece you've had your eye on. Whatever it may be, the knowledgeable and professional band of REALTORS at the CIR REALTY office on CENTRE STREET in SUNDRE will be able, and more than willing, to help you out with any and all your REAL ESTATE needs! Stop in at the CIR REALTY CENTRE STREET office and begin your POSITIVE REAL ESTATE experience! It's another beautiful day in Sundre today and the REAL ESTATE market in town is prime for ALL levels of HOME BUYER'S from the 1st time REAL ESTATE explorers right up to the experienced HOME BUYER and REAL ESTATE investor. If you are any one of the above, we, at CIR SUNDRE HOME TEAM, would love to sit down and have a coffee and chat about any and all your REAL ESTATE needs!! C'mon in to our SUNDRE HOME TEAM, CIR office today! We're on the corner of CENTRE STREET and HWY 27 in the heart of SUNDRE. Congratulations Debra King for being # 4 at CIR REALTY'S NW office for sales in REAL ESTATE for the month of August 2017!!! You've done the SUNDRE HOME TEAM proud!!! September's almost half done, kids are back in school, Centre Street North is all torn up, looks like the roundabouts are being planned and life in Sundre's but a dream! Better still......real estate in Sundre's pickin' up! C'mon by and see what's out there for land, acreages and homes for sale in town. 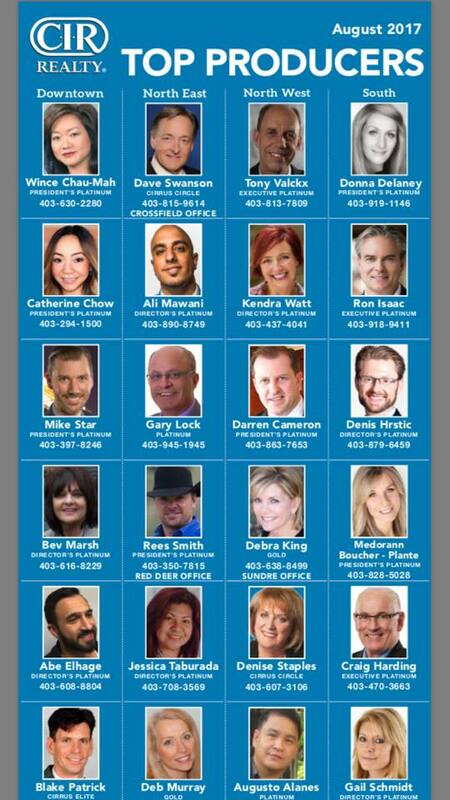 Our REAL ESTATE AGENTS can help you out with ALL your REAL ESTATE needs!! Here's something that only CIR offers for clients who list with them.